Bright eyed children and bright ideas from the mothers made for a great Kids Carnival. Thank you to all the parents who helped with the planning for this event. Not only did the children have fun but especially the seniors were able to communicate with the parents and each other to decide what shops they want. There was also a feeling of unity between parents and children and smiles all around. New born babies have abilities that can’t be taught by anyone. They have initial cognitive abilities that foster a curiosity amongst them. This curiosity involves touching, hitting, throwing, crumpling things that can be seen by the eye as well as stopping things that are moving and looking at them closely. However, this initial curiosity has no real characteristics so leaving it alone will make children grow bored of it and getting angry at children during this time if they do something a little naughty will only crush their curiosity. However, when this initial curiosity involves into curiosity of knowledge it compliments comprehension as well as problem solving. This kindergartens principal Kohetsu Sugawara states that “Children’s academic ability comes from effort and curiosity and it is very important to find what kind of play is liked during discovery time. In order to foster knowledge curiosity amongst children, a bit of knowledge is needed as well as adults who can foster co-operative curiosity through questions. By doing this children become interested in the world around them and begin saying things like “Why is this like this?” and “Let’s try and check this”. By having curiosity children are able to find out things for themselves and they can learn what is right and wrong. Tomorrow marks the start of the long summer vacation. Please enjoy a vacation with your children that can encourage their curiosity of knowledge. 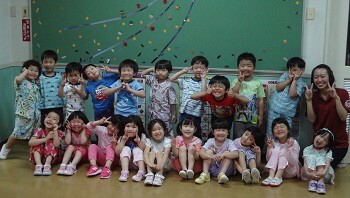 We are looking forward to seeing your children after the summer vacation all grown up.